In September 1696 Emir Ahmad Maan died with no heir ending the Maans rule of Mount Lebanon. The Shihab Emirs succeeded the Maans and in 1697 Emir Bashir Shihab I, nephew of Emir Ahmad Maan, came to power. After his death in 1706 he was succeeded by Emir Haydar who was deposed by the Yemenite originated families in Mount Lebanon after their rebellion against his rule appointing Emir Youssef Alam el Din as new ruler. As a result he fled to Azraeel cave in Hermel , hiding from the rebellions and sent his family members to the Khazen Cheikhs who hided them in their villages in Keserwan taking care of their needs , protecting them and sending him arms and ammunition and in addition, giving him important information and advices . In 1754 Emir Melhem Shihab resigned due to his illness. Supported by the mountain Cheikhs, Emir Milhems two brothers Emir Mansour and Emir Ahmad succeeded him to govern dually Mount Lebanon. Later emir Ahmad was obliged to give up his rule after the loss of the Cheikhs support and Emir Mansour became the sole ruler of the mountain. In 1767 the Khazen Cheikhs aligned themselves to Emir Youssef Shihab, giving him their support. He was son of late emir Milhem and became a serious rival to Emir Mansour on governing the mountain and later his successor. In return to their support, he appointed Cheikh Rameh son of Haydar son of Kaiss el Khazen as governor of the regions Lehfed, Tartaj and JaJ giving him the right of passing the region's rule to his descendants. In 1788 Emir Youssef was deposed and Emir Bashir Shihab II known as Bashir Al-Kabeer (Bashir the Great) became the new ruler of Mount Lebanon. 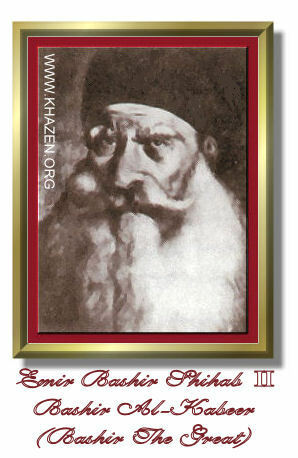 Emir Bashir was born in January 2, 1767. After 3.5 months of his birth, his father emir Kasem died and shortly after his mother was married. Mansour el Shediaq of Ashqoot was assigned to guard and raise her two children Emir Bashir and Emir Hasan. In addition he was in charge of their late father's properties. In 1679 Mansour el Shediaq resigned of his responsibilities and Patriarch Joseph Estephan assigned his friend Cheikh Boutros (Peter) El Khazen to guard and raise the young Emirs and also to be in charge of their late father's properties. The Patriarch choose Cheikh Boutros because he was the most suitable person to do this task for his wisdom, generosity and fairness. Cheikh Boutros took care of the young Emirs as they were his own sons, giving them tremendous care and best education. In 1808 Cheikh Bishara Jaffal El Khazen was appointed by Prince Bashir as Governor of Keserwan region. It is important to note that before his appointment, the Khazens had weak relations and disagreements with Emir Bashir hence they approached Cheikh Bashir Jumblat requesting his help to mediate with Emir Bashir. Reconciliation was held between the two parties and by this Cheikh Bashir Jumblat was responsible indirectly for Cheikh Bishara's appointment. It is also important to note that most of the Khazens favored the Jumblats at that period and in particular Cheikh Bashir Jumblat. In his term the relations between the two families tightened and many of the Khazens stayed as guests of the Jumblats in their village Al-Mukhtara and vice versa. Other Khazens went further more with these relations, like Cheikh Francis Abee Jaber El Khazen who appointed Cheikh Bashir Jumblat as a guardian for his children. In 1822 Emir Bashir deposed Cheikh Bishara Jaffal El Khazen of governing Keserwan and after a year of his death in 1826 he seized the opportunity and claimed himself owner of all Cheikh Bishara's properties including his house and its furniture , leaning on a false claim that he had no close relatives as direct heirs . The Cheikh's wife Mrs Ziara Bishara El Khazen was obliged to sell her late husband's properties to pay the huge amount settled with Emir Bashir of 170,000 Kirch (Ottoman gold coins). Worth to note that in 1825 Emir Bashir also demanded from his strongest opponent in the mountain Cheikh Bashir Jumblat a huge amount of money, he could not afford forcing him to revolt. Emir Bashir crushed the Jumblats rebellion and Cheikh Bashir Jumblat fled to Acre where he was killed by its governor Abdullah Pasha who was Emir Bashir's ally. These practices by Emir Bashir against the Cheikhs of the mountain and in particular the Khazens and the Jumblats, in an attempt to weaken their power and influence, led to several revolts. In 1831 Emir Bashir decided to break away from the Ottoman Empire and allied himself with Muhammad Ali, the founder of modern Egypt, and his son Ibrahim Pasha. 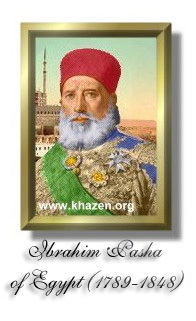 Emir Bashir and Ibrahim Pasha ruled harshly and exacted high taxes. These practices led to more revolts by the Cheikhs and despite the Emir's efforts, the Maronites and Druzes united their forces against him and his Egyptian allies. The Khazen Cheikhs were divided between favor and against Emir Bashir and his allies (Ibrahim pasha and the French). Cheikh Francis Abee Nader El Khazen and Cheikh Dawoud Afif El Khazen were against Emir Bashir and they participated with their supporters in the unsuccessful rebellion against Ibrahim Pasha. As a result they fled with their supporters from Emir Bashir's threat, to Cyprus. In addition, the principal European powers (Britain, Austria, Prussia, and Russia), opposing the pro-Egyptian policy of the French, signed the London Treaty with the Sublime Porte (the Ottoman ruler) on July 15, 1840. According to the terms of this treaty, Muhammad Ali was asked to leave Syria; when he rejected this request, Ottoman and British troops landed on the Lebanese coast on September 10, 1840. Faced with this combined force, Muhammad Ali retreated, and on October 14, 1840, Emir Bashir surrendered to the British and went into exile in Malta. After ending Emir Bashir's term the two Cheikhs came back to Jounieh on board the Ottoman fleet escorted by its Admiral and welcomed by the British Fleet and its Admiral Sir Charles James Napier.